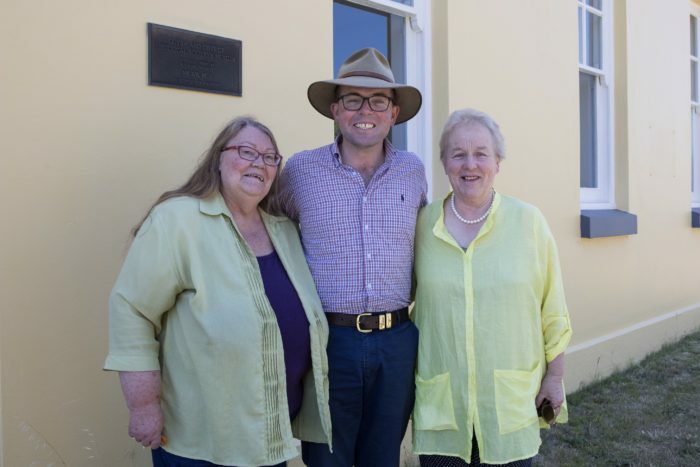 Member for Northern Tablelands Adam Marshall with Guyra Historical Museum President Martha Weiderman (left) and Dorothy Lockyer. MEMBER for Northern Tablelands Adam Marshall today announced $60,346 for Guyra Historical Society to fit-out the Guyra Historical Museum through round two of the NSW Government’s $100 million Regional Cultural Fund. Mr Marshall said the funding support will provide greater security for the hundreds of historically significant items held by the society in the museum. “This project means that the museum will have additional security measures and new cases to ensure the valuable collection items are protected”, Mr Marshall said. “The museum is a wonderful treasure trove with many items held there of local, regional and event national importance. President of the Guyra and District Historical Society, Martha Weiderman, was delighted to accept the funding on behalf of the volunteers and community. “It’s very exciting to receive this funding as it will allow some long-needed internal upgrades as well as beefing up security of the facility,” Ms Weiderman said. “We have a number of exhibits in the museum that are of national historical significance, and the upgrades to electronic security in and around the museum, will certainly give great peace of mind. The Regional Cultural Fund is part of the NSW Government’s $1.6 billion Regional Growth Fund. For more information about the Regional Cultural Fund visit https://www.create.nsw.gov.au/funding-and-support/regional-cultural-fund/regional-cultural-fund-2/ .